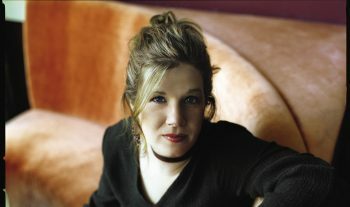 Opening for Dar Williams at The Cabot – 3/17! Exciting news! Marina is honored to be supporting none other than Dar Williams at the beautiful Cabot Theater in Beverly, MA on March 17! One of the most lauded singer-songwriters of her generation, Dar Williams has been captivating audiences with her sheer elegance and honesty in her folk-pop songwriting since the early ’90s. Williams’ growth as an individual over her almost three-decade-long career has gone hand-in-hand with her evolution as an artist. She has toured with such distinguished artists as Joan Baez, Patty Griffin, Ani DiFranco, and Shawn Colvin, and is a regular contributor to the Huffington Post‘s Green Blog. A dedicated environmentalist, Williams toured throughout the northeast visiting children’s camps and planting bee gardens in summer 2011. Marina has long been a fan of Dar’s, first having seen her 15+ years ago (!) at a solo acoustic show. Dar’s exuberant stage presence and insightful, funny, and honest songwriting have continued to inspire Marina as her own performance and writing career has developed. This promises to be a memorable night of original music performed by one of the biggest names in American folk, supported by a local rising star. Don’t miss it! Click here for tickets and event details. This entry was posted in news & updates and tagged acoustic, act, americana, art, artist, banjo, Beverly, blues, Cabot, Cabot Theater, compose, composer, Dar, Dar Williams, duo, fingerpicking, folk, folk guitar, folk style, Gibson guitar, guitar, mandolin, Marina Evans, Martin Guitar, open, opening act, perform, performance, performer, sing, singer, singer/songwriter, solo, songwriter, support, supporting act, travis style, vocal, vocalist, voice by marina. Bookmark the permalink.